Master male anatomy with this multipart kit. Thank to its wealth of optional parts and crisp detail, this toolkit is a perfect reference resource. If there's one piece of advice that all 3D artists, no matter which field they are in, should be given, it’s to learn how to work from references, preferably anatomical human references. This builds many skills, from learning about silhouette and form, to understanding light and shadow, as well as surfaces and materials. These are all key to a good skill set for 3D artists. The problem is choosing which references to invest in. You could create your own, but selecting something pre-made is usually better. Here, there are many options available. One of the best is this multipart kit from 3dtotal which, although not cheap (at around the £200/$260 mark) is thoughtfully developed to account for certain tricky areas to master. The kit, which stands at over a foot tall, is cast in smooth resin, which is well finished – even if there are a couple of lines that could do with a little trimming (an easy job with a craft knife). The sculpted details are captured well and the transfer to casting has kept a great definition of detail. 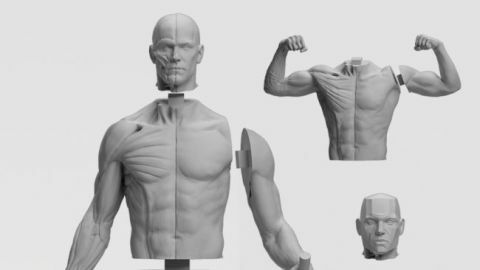 The real benefit of this kit is that it comes with multiple options to enable the artist to focus on a particular task, from muscle deformation to skeletal details. These are themed around arm and hand poses, which are often tricky to get right. There are also two torsos, which really complete the posing, as much of what happens when an arm is moved has an effect in other areas. This in itself shows a good level of thought from the designers, as does the fact that the pieces connect via socket and peg, with magnets fitted to keep things from moving. These small details are what make this an attractive option for anyone looking for references that cover écorché, skin, bone and particularly muscular details. A few minutes' clean up time after opening the model and you’ll be set. If you often need anatomical references, then this is a fantastic resource that has been thoughtfully developed with the artist in mind. This article was originally published in issue 233 of 3D World, the world's best-selling magazine for CG artists. Buy issue 233 here or subscribe to 3D World here.